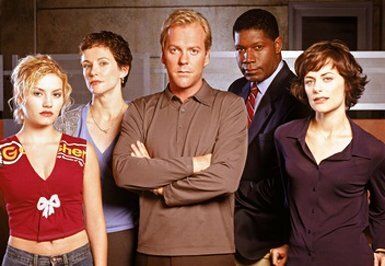 Cast From Season 1 Of "24"
For the past eight years, the television drama world has been fixed on Fox’s “24.” Despite falling ratings and an ever complicating plot line, the show still remains relevant in 2010. With the news on Friday that Fox would not be renewing the show for a ninth season, there is already speculation that the show will not be picked up by another network and its run will be finished. On Tuesday, November 6th, 2001, with the tragic events of 9/11 still in our minds, we first invited Keifer Sutherland and Fox’s brand new “24″ into our living rooms. No one knew what to expect. For the first time, a show would run in real time and the content of the show would not only be relevant, it was be based in reality. Also unique to the show was the running storyline. Each week was part of a complete story unlike shows like “Law & Order” where any episode can stand on its own. Television critics were unsure at the time how this would play out for Fox. Many thought that the format would not work because of the audience commitment required to be an informed viewer. People ate it up. The show was often rated highest in its slot, and was cross promoted with the brand new show “American Idol” which premiered during “24′s” second season. Sutherland’s incredible performances as Jack Bauer season after season garnered him numerous Emmy nominations and one win in 2006, while the show took home writing and best drama awards at both the Emmy’s and Golden Globes. Luckily, if this is the final season, the show has ended just in time. With more and more convoluted plot lines, the stories have become redundant and generally predictable. If the show were to continue on, it would surely run itself into the ground. With the end in sight, it is easy to say that this show has cemented itself into the world of pop culture as one of the best dramas of all time. When a show is great, you need to learn when enough is enough and for Sutherland and the rest of “24,” the time has come. Thanks for the past eight years!! THIS IS THE WORST F*CKING SHOW EVER!!! THANK GOD FOX FINALLY GOT SOME SENSE KNOCKED INTO THEMSELVES!! !